We love deviled eggs in my family, especially my mom’s version with dill pickles, but we also love them with bacon and chives as well. I stumbled upon this version from America’s Test Kitchen which had me intrigued because of their simplicity. 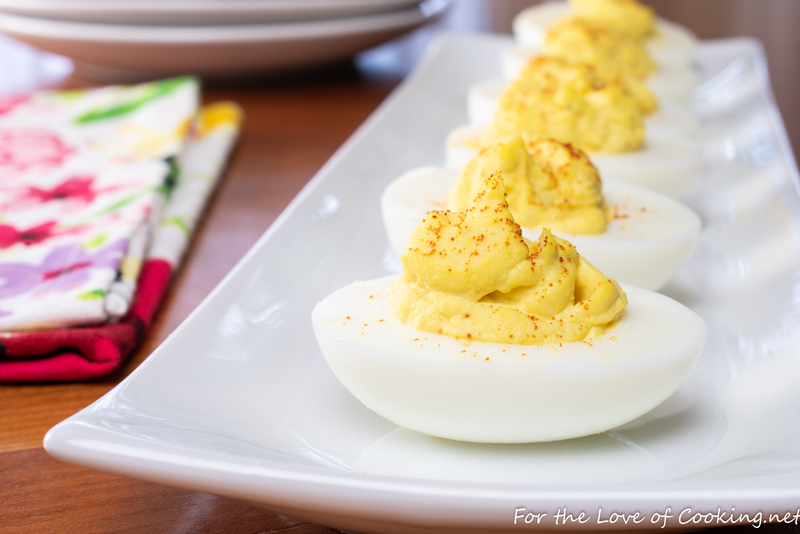 I decided to make the deviled eggs recently and my kids and husband all agreed that these eggs were delicious. They all loved the sweet and tangy flavor that the course mustard seed and the apple cider vinegar gave them. 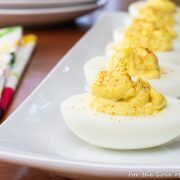 I loved the creamy smooth filling and how quick and simple these classic deviled eggs were to throw together. Side Note: Older eggs are known to be easier to peel after boiling. Place the eggs into a saucepan then cover completely with cold water. Bring to a boil over high heat then boil for 1 minute. Turn the heat off and remove from burner. Cover with a lid and let the eggs sit for 10 minutes. Gently pour out most of the hot cooking water then fill the saucepan with ice cold water until the eggs are cool to the touch – about 1-2 minutes. Gently tap the bottom of the egg on the counter to crack then carefully roll the egg on the counter to crack the rest of the shell. Carefully, peel the shell from the egg. If the shells are stubborn, try peeling them under warm running water. Cut each egg in half lengthwise and arrange on a serving tray, discarding two worst looking halves, to allow for fuller stuffed eggs, if desired. Set aside. Carefully drop the yolks into a bowl and mash them with a fork until no lumps remain. Add the mayonnaise, apple cider vinegar, course mustard, Worcestershire sauce, sea salt and freshly cracked pepper, to taste, and mix well with a rubber spatula until creamy and smooth with no lumps. Spoon the yolk mixture into a small zip lock bag. Squeeze it until the filling is in the bottom corner of the bag. Snip off the corner of the bag then gently squeeze and fill each egg white half. Sprinkle the a touch of paprika. Serve and enjoy. Bring to a boil over high heat then boil for 1 minute. Turn the heat off and remove from burner. Cover with a lid and let the eggs sit for 10 minutes. Gently pour out most of the hot cooking water then fill the saucepan with ice cold water until the eggs are cool to the touch – about 1-2 minutes. Gently tap the bottom of the egg on the counter to crack then carefully roll the egg on the counter to crack the rest of the shell. Carefully, peel the shell from the egg. If the shells are stubborn, try peeling them under warm running water. Cut each egg in half lengthwise and arrange on a serving tray, discarding two worst looking halves, to allow for fuller stuffed eggs, if desired. Set aside. Carefully drop the yolks into a bowl and mash them with a fork until no lumps remain. Add the mayonnaise, apple cider vinegar, course mustard, Worcestershire sauce, sea salt and freshly cracked pepper, to taste, and mix well with a rubber spatula until creamy and smooth with no lumps. Spoon the yolk mixture into a small zip lock bag. Squeeze it until the filling is in the bottom corner of the bag. 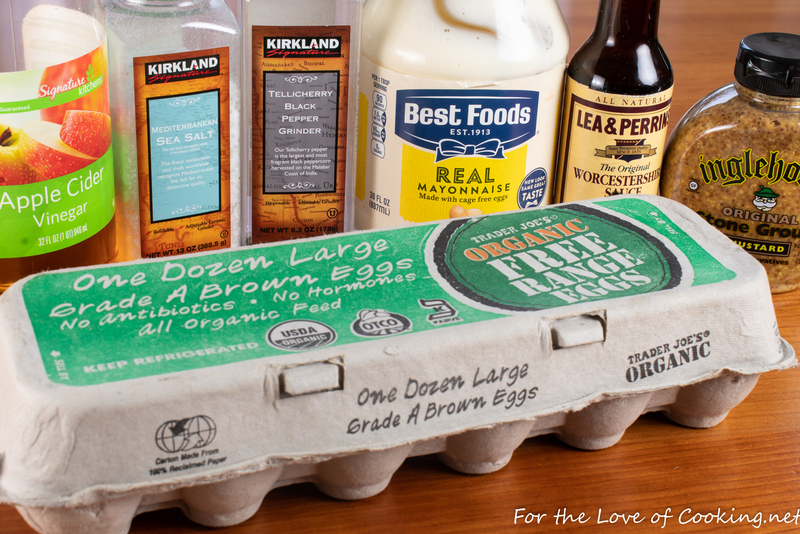 Snip off the corner of the bag then gently squeeze and fill each egg white half. Sprinkle the a touch of paprika. Serve and enjoy. I love deviled eggs. Have to try making them with this mustard. That’s different! Sounds interesting. I love deviled eggs. 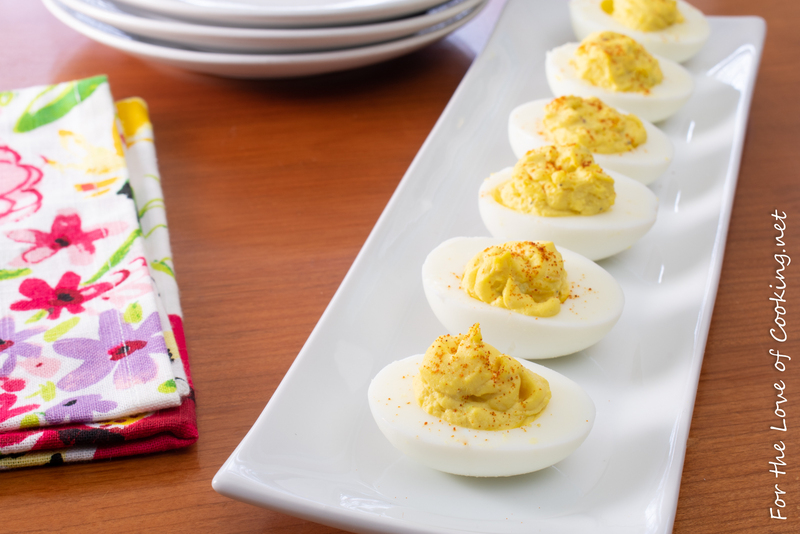 I never really had deviled eggs growing up so I never think to make them, though I’ve loved them when I’ve had them at parties! Love the idea of this simple version.